They asked me to say a few words a couple times over the course of the convention to which I was honored to accept. I have been so very humbled by this opportunity this year. I wrote much more about all that HERE and HERE and HERE. Oh and HERE (but mostly that first one). 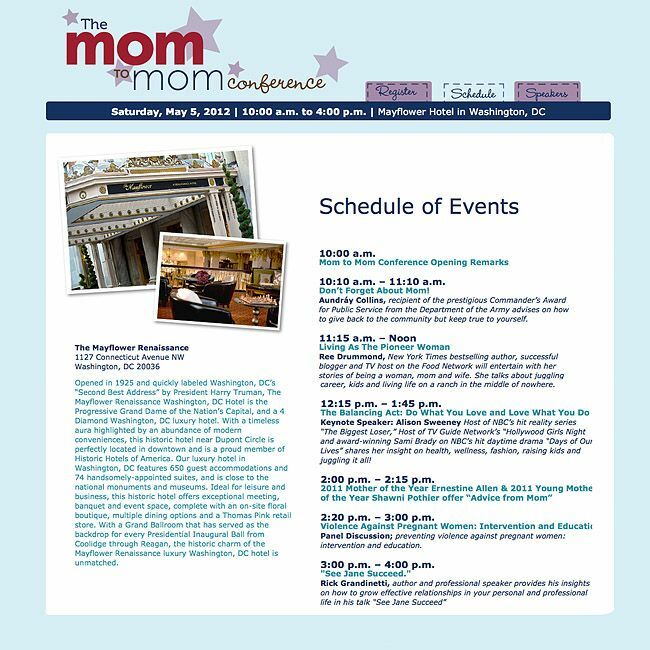 Anyway, I'm also really excited about this convention because aside from the big gala awards dinner and the speeches, and all that we did last year, American Mothers is doing a motherhood conference on Saturday called "Mom to Mom." 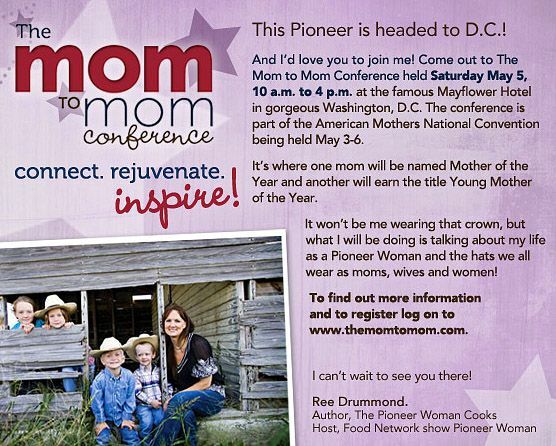 Yes, the one and only Pioneer Woman. See up there at 11:15? And then look at 2:00. Now if that's not intimidating I don't know what is. But luckily I only have like five minutes so I think I'll survive. For more info. on the other stuff that will be going on at the convention click HERE and for bios on all the speakers click HERE. Shawni, so funny you mentioned Ree. For a sec I thought I was at Ree's blog. Your two blogs are the only two I follow. I follow Ree's because we grew up in the same home town and she sat right behind me in High School French class.. I pretty much didn't learn much French that year because she was just as funny back then and we both loved talking. Have fun in DC. Ree will love ya! Oh, Shawni, that is so cool! Wouldn't it be fun if Ree invited you out to the ranch for dinner? (Because that's the way my imagination runs....towards the food!) I bet she'll be so fun to listen to. I hope you have a wonderful time! You're so cute Shawni:) This post made me laugh! I wish I could go see both of you speak. I had a dream one night that I got invited to the ranch for dinner so I for one think you definitely need to score an ranch invite so I can live through you! It's funny that you talk about Ree like that, thats how i think of you! Like, oh i wish we could meet, we would be BFF's ahahha. Also, i think it would be great to meet Alison Sweeney. I really like her on the biggest loser, she gets emotional when something good or bad happens.. a real down to earth girl it seems. You will have a great time, and be such an inspiration! That's exciting! I love the Pioneer Woman! What a fun weekend for you! So, I'm excited to meet both you ladies. I'm actually going to a PW book signing here in Seattle next week. So yeah, I think I'm also well on my way to become BFFs with Ree. Good luck planning your talk, you'll do GREAT. You hold Ree in the same regards I hold you! I wasn't going to ever actually write this in a comment but when I first found your blog a few months ago I read EVERYTHING (almost) but literally TONS of stuff you've written on mothering- then I checked out your parents' website and got one of their books from the library- then I went to your sister's "Power of Moms" site and LOVE it- but I actually had a dream one night a few weeks ago that I was invited to your house for dinner! haha I was right there in your house- all the pictures I'd seen- haha It was hilarious. It was so fun to "talk" to you and your cute family. I would just be thrilled to meet you one day. You've got big fans too, Shawni! :) Enjoy your trip! 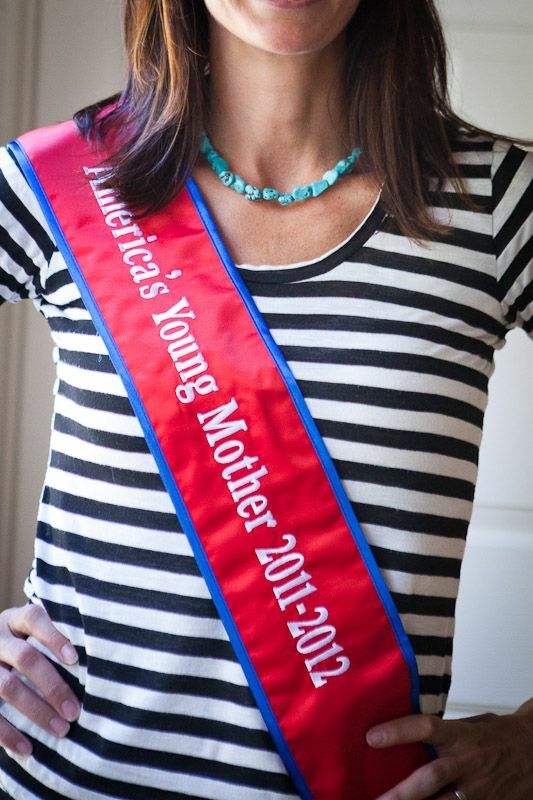 So glad you documented the sash! And I so want to go to D.C.! When I was 12 I used to go to a friend's house after school to do "homework" but what we really did was watch "Days of our lives". My MOm absolutely forbade us from watching it, but my friend's Mom watched it herself and made us cookies to watch it with (this only lasted a couple of months before my Mom caught on!). I can only think of Sami Brady the bratty girl from Days of our Lives from all those years ago everytime I see Allison Sweeney! Love your sash. Are most of the Mom winners lds? I remember Sister Dalton's daughter won last year or the year before too.